Nucleosomes are fundamental units of chromatin released by internucleosomal cleavage during cell apoptosis, and nucleosomal material has been demonstrated in the surface blebs of apoptotic cells.1 Recent studies have shown the presence of antinucleosome antibodies in systemic lupus erythematosus (SLE).2,3 We measured the concentration of antinucleosome antibody present in the sera of patients with SLE and compared it with the concentration in healthy and disease control patients using a commercially available enzyme linked immunosorbent assay (ELISA) kit. Peripheral blood was sampled from 95 white patients with SLE (87 female, median age 47.0 years), 48 white patients with rheumatoid arthritis (RA) (41 female, median age 55.5 years), 28 white patients with fibromyalgia (23 female, median age 47.0 years), and 95 white normal healthy volunteers (64 female, median age 31.0 years). All patients with SLE fulfilled the American College of Rheumatology (ACR) diagnostic criteria. An indirect solid phase immunometric assay (ELISA) was used for the quantitative determination of IgG autoantibodies to nucleosomes (Organtec Diagnostika, Mainz, Germany; antinucleosome kit), according to the manufacturer’s instructions. This assay is based on microplates coated with polynucleosomes, purified from a human cell line. The sensitivity of the test is given as 1 U/ml. Values greater than 20 U/ml were recorded as positive, according to the manufacturer’s instructions. dsDNA antibody concentrations were determined by the Farr assay (Immunodiagnostic Systems Ltd, Bolton, England; gamma-B anti-dsDNA kit). Values of 8 mg/l or above were recorded as positive. Non-parametric statistical methods were used. The total number of patients with SLE (n=95) fulfilling each ACR criterion was as follows: malar rash 53, discoid rash 9, photosensitivity 70, oral ulcers 56, arthritis 49, serositis 17, renal disorder 20, neurological disorder 11, haematological disorder 63, immunological disorder 70, antinuclear antibody 91. Median SLE Activity Measure (SLAM) score was 6.0 (interquartile range 5.0–9.0). Serum antinucleosome antibody was positive (>20 U/ml) in 61/95 (64%) patients with SLE, none of the healthy controls, none of the patients with fibromyalgia, and in 2/48 (4%) rheumatoid arthritis controls (fig 1). Antinucleosome antibody concentrations were significantly higher in SLE (median 43.0 U/ml) than in healthy controls (median 4.0 U/ml, p<0.001), fibromyalgia controls (median 8.3 U/ml, p<0.001) and rheumatoid arthritis controls (median 5.0 U/ml, p<0.001). Serum anti-dsDNA antibody levels were positive (8 mg/l) in 49/95 (52%) patients with SLE, 3/48 (6%) rheumatoid arthritis patients, none of the patients with fibromyalgia, and none of the healthy controls. The antinucleosome antibody test therefore had a sensitivity of 64.2% compared with a sensitivity of 51.6% for the anti-dsDNA antibody test. The specificity of the antinucleosome antibody test (98.8%) was similar to the specificity of the anti-dsDNA antibody test (98.2%). Forty one (43%) patients with SLE tested positive for both antinucleosome antibodies and anti-dsDNA antibodies. Twenty (21%) patients with SLE were positive for only antinucleosome antibodies. Eight (8%) patients with SLE were positive for only anti-dsDNA antibodies, and 26 (27%) patients with SLE were negative for both anti-dsDNA and antinucleosome antibodies (table 1). Antinucleosome antibody concentrations correlated positively with anti-dsDNA antibody titres (r=0.493, p<0.001). Antinucleosome antibody concentrations did not correlate significantly with the global SLAM score, or with the erythrocyte sedimentation rate. Antinucleosome antibody concentrations were higher in patients with SLE fulfilling renal criteria for diagnosis (n=20, median 80.5 U/ml) than those not (n=75, median 33.0 U/ml, p=0.012), higher in patients with SLE fulfilling haematological criteria for diagnosis (n=63, median 72.0 U/ml) than those not (n=32, median 14.5, p=0.003), and higher in patients with SLE fulfilling immunological criteria for diagnosis (n=70, median 64.0 U/ml) than those not (n=25, median 14.0 U/ml, p=0.027). In SLE the antinucleosome antibody concentration also correlated negatively with the lymphocyte count alone (r=−0.379, p<0.001), but not with total white cell count, neutrophil count, or monocyte count. Our study confirms that antinucleosome antibodies are common in SLE.2,3 We have also shown that antinucleosome antibodies are not usually present in healthy subjects or in patients with rheumatoid arthritis or fibromyalgia. Our patients with SLE had relatively low disease activity, suggesting that antinucleosome antibodies are not confined to patients with active disease. The relationship of antinucleosome antibodies with lymphopenia has not previously been described. It could be speculated that apoptotic lymphocytes are a major source of nucleosomes for the development of autoantibodies. Alternatively, antinucleosome antibodies may cause lymphocyte apoptosis. No single test exists for the diagnosis of SLE. The antinucleosome antibody ELISA that was used in this study is a straightforward laboratory test that can be performed on large numbers of samples in a relatively short period of time. More than one in five patients with SLE had antinucleosome antibodies but were negative for dsDNA antibodies. Thus the antinucleosome antibody test may be particularly useful in the diagnosis of SLE when anti-dsDNA antibodies are not present. A similar finding has recently been reported in a group of Korean patients with SLE.4 We therefore propose that an antinucleosome antibody ELISA test should be carried out (alongside other tests) to aid in the diagnosis of SLE. 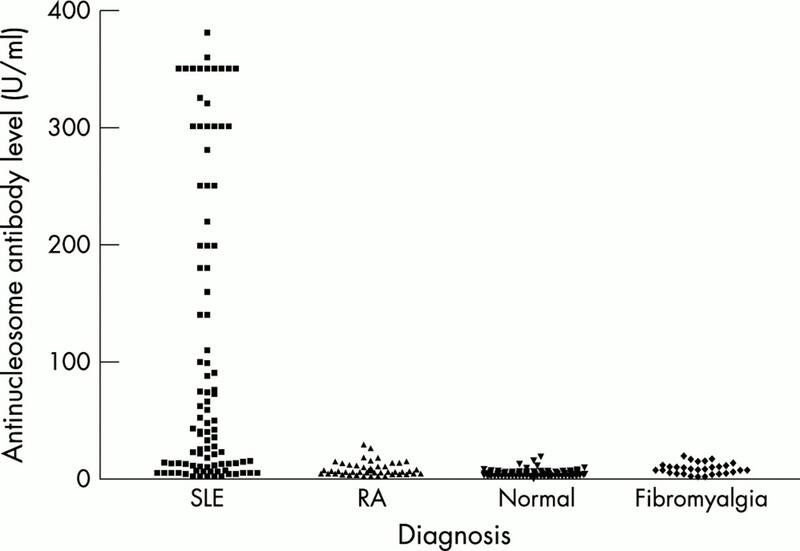 Scatter plot demonstrating the concentration of antinucleosome antibodies detected in each group of patients. Values >20 U/ml are positive. Casciola-Rosen LA, Anhalt G, Rosen A. Autoantigens targeted in systemic lupus erythematosus are clustered in two populations of surface structures on apoptotic keratinocytes. J Exp Med1994;179:1317–30. Amoura Z, Koutouzov S, Chabre H, Cacoub P, Amoura I, Musset L, et al. Presence of antinucleosome autoantibodies in a restricted set of connective tissue diseases: antinucleosome antibodies of the IgG3 subclass are markers of renal pathogenicity in systemic lupus erythematosus. Arthritis Rheum2000;43:76–84. Bruns A, Blass S, Hausdorf G, Burmester GR, Hiepe F. Nucleosomes are major T and B cell autoantigens in systemic lupus erythematosus. Arthritis Rheum2000;43:2307–15. Min DJ, Kim SJ, Park SH, Seo YI, Kang HJ, Kim WU, et al. Anti-nucleosome antibody: significance in lupus patients lacking anti-double-stranded DNA antibody. Clin Exp Rheumatol2002;20:13–18.